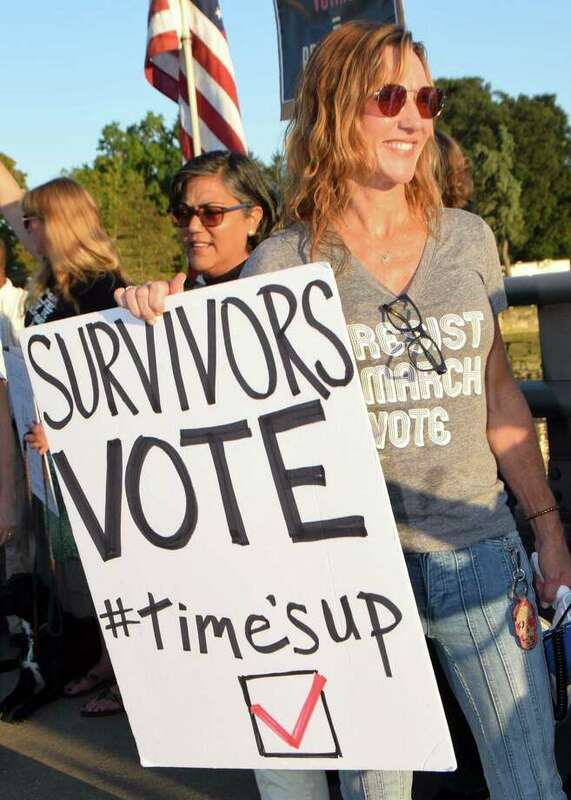 Westport resident Darcy Hicks protested at the Ruth Steinkraus Cohen Bridge in Westport on Oct. 7 for an event called "Survivors Vote — Rally for Change." WESTPORT — It’s said your friends say a lot about who you are. Perhaps the same is true with the supporters of political candidates. In this last week before the elections, the Westport News interviewed a strong supporter of each of the candidates in the two major political races that have captivated Westport’s attention this year. In the race for the 26th District state Senate seat, Republican incumbent Toni Boucher is said to be dedicated to helping her constituents with personal problems while a fan of her opponent, Democratic upstart candidate Will Haskell, said he has the fresh perspective and dedication to gun regulation and transportation infrastructure investment needed in Hartford. Four-term Democrat Jonathan Steinberg understands Westport’s values, and by extension the 136rd House District, his ally said. A fan of Steinberg’s opponent, Republican insurgent Greg Kraut, said Kraut has the ideas to rectify the state’s fiscal crisis. A former Republican member of the Connecticut Senate representing Fairfield and parts of Newtown and Westport, John McKinney said he’s seen Sen. Toni Boucher’s hard work on behalf of her constituents. “I’ve never known anyone to work harder and with more energy than she has,” McKinney, 54, said, adding, “What doesn’t get a lot of focus that’s incredibly important to people is the work you do in your town helping people out,” in situations such as senior struggling to gain access to state services. “Those kind of everyday things can help people’s lives and no one works harder at that than Toni,” McKinney said. Constituent services aside, Boucher works to improve the state’s economy by securing good paying jobs, a strong education system, and transportation infrastructure that works for businesses, McKinney said. “There’s a lot that goes into a strong economy and Toni’s experience in the state legislature and in the real world running her own business makes here well-suited to represent Westport,” McKinney said, adding Boucher is unafraid to vote against the Republican Party if she believes she’s doing what’s right for her constituents. Lee Race had an ‘aha’ moment while listening to Will Haskell speak at a neighbor’s home in April. “When he talked about what’s at stake in the election and everything that’s happened not only in Connecticut, but around the country, I saw everything clearly,” Race, 54, said. Race, a PR professional who moved to Westport with her family in 2016 after living in London and Manhattan, said Haskell’s solutions for transportation and gun reform inspired her. Although she has always leaned Democrat, Race was never politically active before volunteering for Haskell’s campaign with her daughter Kylie Race, a Staples High School sophomore. Because Haskell is a digital native, he has a fresh perspective, especially on the issue of tolls, Race said. “It’s so straightforward to someone like him. The technology is available so you should have tolls and those funds should go toward improving roads and commuting infrastructure, which would make Connecticut a great place to live,” Race said. As a parent, Race said the normalization of lockdown drills feels like a failure of adults, and people like Haskell and her daughter are both aware of the ways politicians are letting kids down and poised to make a change. “He just has great views. I think people find him really persuasive and authentic,” Race said. After 27 years in business, Jimmy Izzo’s Main Street store, Crossroads Ace Hardware, closed in May. Izzo, a native Westporter and member of the Representative Town Meeting, credits Crossroad’s decline to Amazon, taxes and failing local retail. Greg Kraut has the outsider perspective and dedication to Westport’s financial interests needed to reverse town’s falling real estate prices and economy, Izzo, 53, said. “I think Greg would come in with some innovative ideas and put Westport first and foremost. He has no allegiance to any of the Hartford insiders and I think that’s a good thing when it comes to key financial votes,” Izzo said. Kraut’s plan to do away with the estate tax will help mitigate the flight of Westport’s elder population to Florida, Izzo said, noting the outflux results in less spending at local stores and sales tax revenue. Most important to Izzo is that Kraut promises to vote with the financial interests of Westport, unlike incumbent Jonathan Steinberg, who voted to extend the state workers pension agreement, Izzo said. “These are unsustainable, unrealistic benefits that we’re giving away,” and the cost will be shouldered by taxpayers, Izzo said. Westporters pay high taxes to Hartford and get nothing back, but Kraut will fight to bring more state funding to town, Izzo said. “We need to get value for our dollar and I think at the end of the day a change would be fantastic,” Izzo said. Darcy Hicks grew up in Westport and has raised her own family in town just like incumbent Rep. Jonathan Steinberg. Hicks said Steinberg understands and fights for Westport’s values in Hartford. “The fact that he grew up here and knows the fabric of Westport and what makes us different than other suburban Metro North suburbs is so valuable to our town,” Hicks, 52, said. Through his mother, an artist and writer, Steinberg learned the importance of Westport’s artist community, both to the economy and continuing attractiveness of Westport, Hicks, an artist herself, said. Not only does Steinberg stand up for women’s rights, gun reform, environmental protection, and health coverage, but he also votes in Westport’s best interest, even if doing so requires breaking party lines, Hicks said. Steinberg voted with a small group of House Democrats against Gov. Dannel P. Malloy’s proposed tax increase in 2011 and the 2015 budget deal, that also proposed a tax hike, in order to prevent more taxes for Westporters, Hicks said. Listening to constituents is Steinberg’s strength, Hicks said, noting she once had a long conversation with Steinberg about pervasive standardized testing in schools and he changed his position to accommodate concerns of teachers like her, Hicks said. “He really spends time with people and that creates a reputation of a man who has integrity and who people are willing to work with, which is what we need right now,” Hicks said.